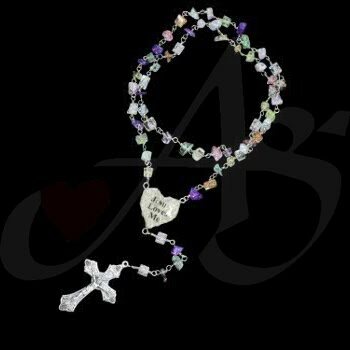 Here is another First Communion Rosary. This rosary is a little more colorful for the first two. The stones here are multi-colored quartz chips, and clear crackled quartz cubes. The center piece says “Jesus Loves Me” and on the opposite side is the Communicant’s name. If you would like a Communion Rosary, or a unique piece of jewelry, contact us! Today’s piece is a continuation of the line of First Communion Rosaries. This Piece is made with black obsidian, and gray jasper. Both are earthy tones, and coincidentally igneous rock – but that is not important. In the center of the rosary are the words “Jesus Loves Me” and on the opposite side is the child’s name. 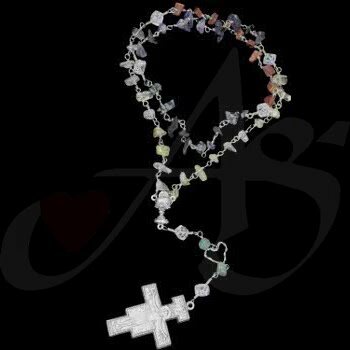 If you would a commemorative Rosary, or a unique piece of jewelry, contact us! Today’s specialty Rosary is another First Communion. 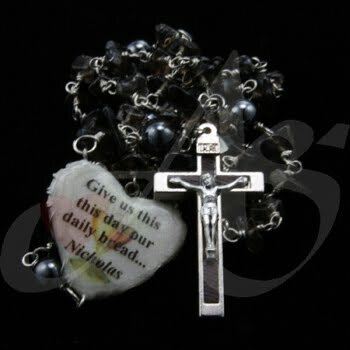 This piece has an added touch of personalization with a prayer on the centerpiece. 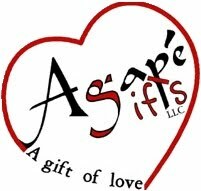 This method is not widely used, and Agape Gifts was one the first company to use it to personalize rosaries. 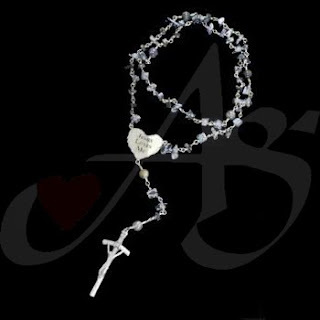 This rosary is made with translucent tiger eye, for the “Hail Mary’s”, and grey hematite, for the “Our Father’s”. As with all our rosaries, this is made with hand-twisted nickel and is unbreakable. If you would like a similar piece, or a unique piece of sacramental jewelry, contact us! This begins our “specialty week”. Throughout this week we will be exhibiting commemorative First Communion and Confirmation Rosaries, Finger Rosaries and Rosary Bracelets. This piece is a rather generic Rosary, but the centerpiece is of the Eucharist and a Chalice. The First Communicant actually picked out all the stones on this rosary. If you would like a special Rosary for your Confirmandi, First Communicant, or any occasion, contact us! This is a great pair of earrings. This is another piece that can go with both casual and dressy wear. All the links in the silver were hand-made and hand-linked. Hanging is a single 18/20 karat gold ball. The hand-made woven links reflect the unity of family and friends – all tightly bound together gathering to the Son. This piece is currently available. If you would like this piece, a similar piece, or a unique piece of jewelry, contact us! These earrings are unique because of a special feature. The bottom set of green crystals are Aurora Borealis coated Swarovski Crystals, and the top three tiers are Chinese crystals. All the wire work here is hand-worked. These earrings are two in one. You can have a green bud post or the chandelier hand linked crystal representing the Jesse Tree. Multi-purposeful, wear everyday or dressy! This piece is currently available. 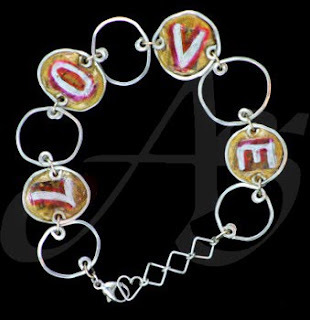 This bracelet is made from polymer and sterling silver. The polymer was hand-crafted, even down to the color. After the silver rings were made, filled with the clay and cured, Laura then hand-wrote ‘L’ ‘O’ ‘V’ ‘E’ on the polymer. Because it is made with polymer, the bracelet is very light – and having a great message, it is a great anytime, anywhere bracelet! If you would like a similar piece, or a unique piece of jewelry, contact us! This is a wonderful pair of earrings. Not only are they completely hand-made, but they are also rather light-weight. The silver center pieces are made from PMC Clay, which is .999 pure silver. 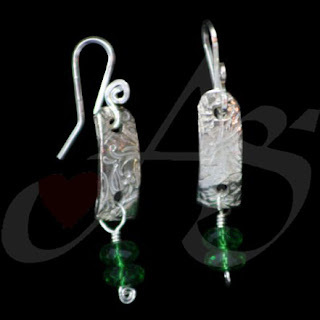 The green Chinese crystals are on sterling silver wire – hand manipulated by Laura. The ear hooks are also crafted by Laura out of square silver wire. This piece is currently available. Today’s piece is similar to another one we featured awhile ago. However, the previous bracelet, was made of 200 different crystals. 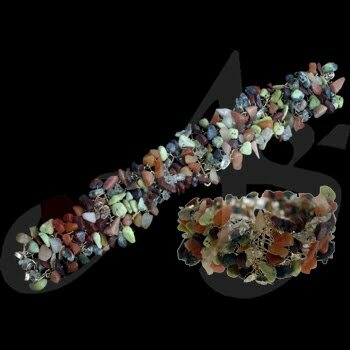 This bracelet is made of 300 stone chips. These chips were placed right into the wire when the bracelet was being hand knitted. Since the bracelet is hand-knitted, it is strong, yet flexible. If you would like a similar piece or a unique piece of jewelry, contact us! Today bracelet is definitely unique. This is a chain-maille bracelet. Each of the metal loops were individually made. When the other rings were placed inside the individual ring, it was soldered closed. It is rather lightweight, but flows around the wrist. This piece is currently available, the next time you see us – try it on! If you would like this piece, a similar piece, or would like a unique piece of jewelry, contact us! 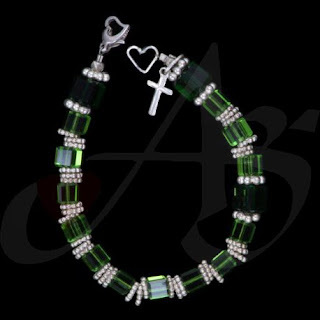 In the spirit of St. Patrick’s day, I have posted a green rosary bracelet. This rosary bracelet is made with cube faceted Chinese crystals, the “Hail Mary’s” are green, and the “Our Father’s” are a Kelly green. Green reminds us of new life, hope, a refreshed beginning; similar to the waving palm branches on Palm Sunday – a day of herald joy. This piece is currently available. If you would like this piece, a similar piece, or a unique piece of jewelry; contact us! What type of jewelry would our viewers like to see? Please leave a comment below or e-mail us! Thank you for faithfully viewing our pieces! 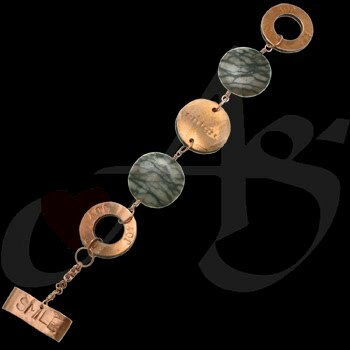 This Bracelet, is answering a recent request for more copper pieces. It is made with jasper, copper and polymer clay. The two flat stones in the middle of the jewelry are jasper. The copper pieces are double-sided with an 1/8” of polymer separating them. On each of the copper rings, “Joy” is stamped three times. On the center copper-piece “Happiness” is stamped. “SMILE” is stamped into the toggle bar. This piece is currently available. 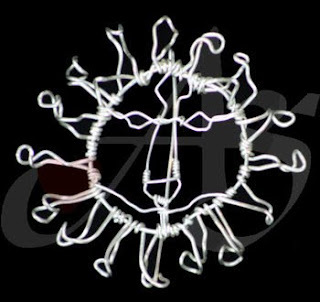 If you would like this piece, a similar piece, or a unique piece of jewelry, please contact us! 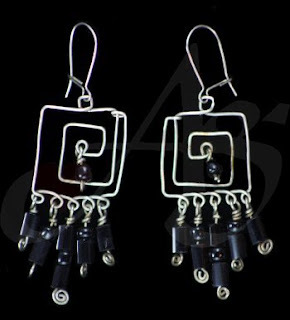 These pair of earrings resemble being in a maze, the maze of life. The wire was hand twisted, and the black beads were all hand strung and wrapped. Many times we feel alone, a path singularly raveled, but in reality we have family and friends praying for us supporting us through our journey. This piece is currently available; contact us if you are interested! Today’s piece is a rosary bracelet. This rosary bracelet was designed by Chloe. Again, the gold-filled wire is hand-twisted. All of the “Hail-Mary” beads are different shapes and colors which add a nice dynamic to the jewelry. 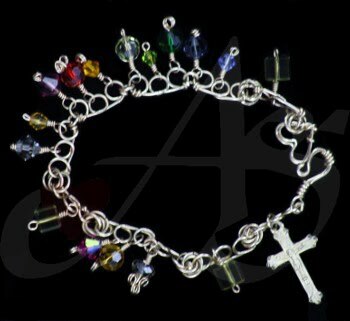 The colorful rosary bracelet is reminiscent of the promise covenant with God via rainbow. The dangle crystals represent the twinkly raindrops after the storm. This piece is currently available. Contact us for more information! If you would like this piece of jewelry, a similar piece, or a unique piece; contact us! Today’s earrings are a great dressy-casual pair. 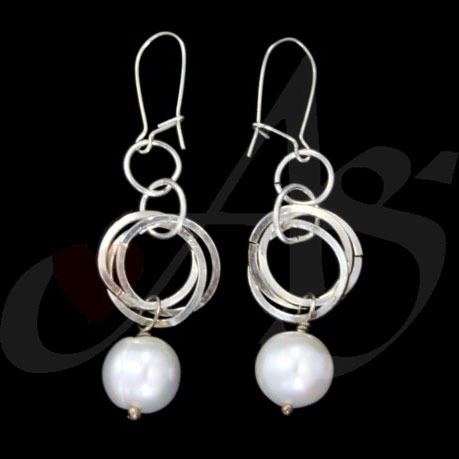 The cultured pearls on the bottom add a nice dynamic to the multiple sterling silver rings. The sterling silver rings are hand-made. These earrings are currently available. Today’s piece is an ankle bracelet. All the wire work is hand crafted. The Blue squares are glass. This casual anklet will go with just about anything. This piece is currently available. This is a fun bracelet to wear because of the hanging garnets. The three-loop wire pieces are made from gold-filled 14k.20 wire links. Wrapped around those (to lock the beads on) and connecting the whole bracelet together is sterling silver .925 wire. The hanging beads are garnets wrapped with gold filled wire. This bracelet represents Christ’s Love to us through His Blood – the droplets that were given to us for new life. This piece is currently available. If you would like this piece, similar piece, or a unique piece of jewelry, contact us! 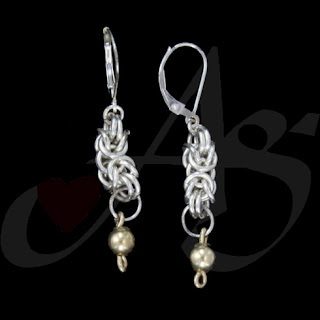 Today’s selected piece is a pair of earrings. The metal piece on top is .999 pure silver. The pure silver piece was made from a silver PMC and was completely hand designed by Laura. The green pieces dangling are the green Chinese crystals. 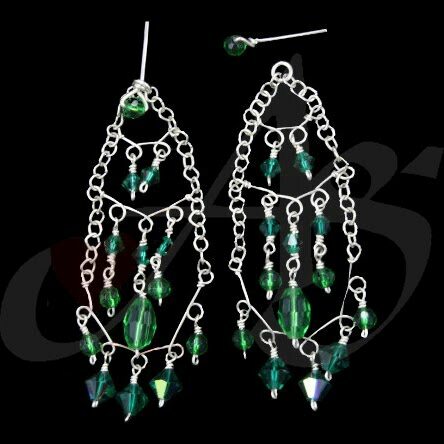 This earring represents new life with the green crystal and the vine imprint on the pure silver. This piece is currently available! Today’s bracelet is another turquoise one, since everyone liked our last turquoise piece. 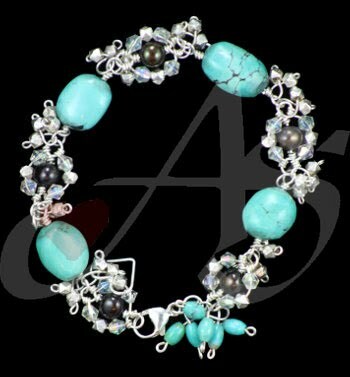 This bracelet, however has real turquoise, rather than turquoise polymer. In between each of the turquoise nuggets are black cultured pearls which are surrounded in a halo of white AB crystals. 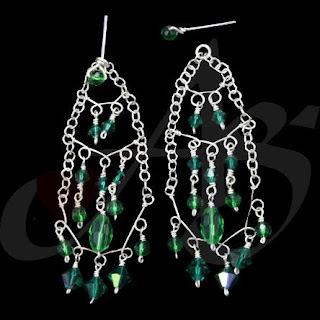 On either side of these sets are 4 crystals that dangle from the bracelet. From the clasp 6 small turquoise rice beads dangle. All this dangling gives extra flair and adds a unique personality to the bracelet. This bracelet is currently available! Today’s focus is a beautiful pin. This pin is formed into the face of a lion. The Lion can be represented as many things, or just a lion. When designing this, Laura was focusing on the “Lion and the Lamb”. With this pin, you can have the Lion close to your heart. This piece is currently available. If you would like this piece, a similar or unique piece of jewelry, contact us! This is a rosary bracelet with hematite and pearls. 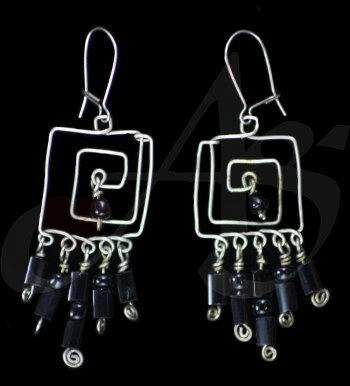 Around the pairs of hematite are hand-formed copper links. The bracelet is strung with sterling silver, and double wrapped, like our rosaries, which will make this bracelet very durable. This rosary bracelet represents the purification of reconciliation, in that the hematite reminds us to pray as a form of repentance while the pearls are the wisdom and beauty of God cleansing our soul to a marvelous sheen. The pearls are a persistent reminiscent to trust in God’s wisdom with much hope. This bracelet is currently available for $150. If you would like this piece of jewelry, a similar piece, or a unique piece of jewelry, contact us! This is a bracelet made with polymer clay. The stones in the polymer clay are special stones that can withstand the heat of firing without discoloring. The words on the flip-side of the bracelet are from a stamp. Each of the polymer squares were handmade, along with the metal wire-work. On either side of the clasp is a single gray freshwater pearl.